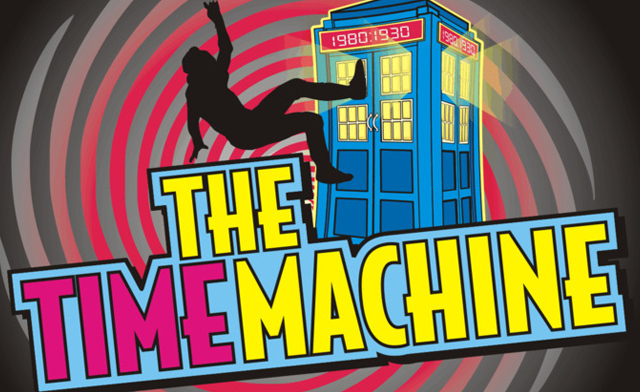 The Time Machine is not your typical dinner theatre production. Seated at a long table amidst a flurry of other strangers you are ushered into the 1980s as the exclusive guest ofAlexis Carryingbag and other socialites, dignitaries and artists, all who are awaiting the arrival of the highly anticipated Time Machine. This is interactive theatre beneath disco lights, sound effects and an eclectic mix of very strange people. The actual drama is convoluted and although efforts have been made to adapt and modify features from various classics including HG Wells’ novel of the same title and Dr Who the effect is a rather unsuccessful mosaic of highly exaggerated characters who play out a rather vapid storyline. Alexis Carryingbag (played by Emma Walmsley) is a conniving superficial multi-millionairess determined to get what she wants and on this night in 1985 her agenda is clear: to own the time machine and get her man, Cyril Bang (Simon Robinson). Unfortunately, Cyril already has a wife the bossy Adora Bang (played with a certain flair byTeagan Robertson) but has been having secret clandestine trysts with Alexis thanks to the wonders of the Time Machine. Of course, all this is most disturbing to Sigmund Pood (Ben Loxham) who along with the recently ‘sexecuted’ Hg Bells was responsible for this remarkable contraption that transports people through the temporal zones. And if there weren’t enough lovers and madmen there is also Dexy Dandy-Pants (Phoenix Lee Jones) who is Adora Bang’s former lover. He also has the best costume! If that was enough to make your head spin then at least you can be grateful there is crime novelist Hercule Twiggle(Craig Thompson) who does (on numerous occasions) recount the various events that have taken place during the night and by simple powers of deduction points out the scheming villains who undertake murder to achieve their wicked plans. The highlight of the evening was the exuberance of the cast and their commitment to entertaining their audience. Thompson is the stand out performer of the night keeping up a constant patter of light and witty chit chat and making efforts to involve all guests. He also organizes an 80s pop quiz and is a warm and entertaining host. Walmsley has the best voice of the cast but unfortunately her singing surpasses her very one-dimensional performance. Luckily however, Robertson, Jones and Loxham all offer consistently good performances during the night maintaining a rapport with the audience and working hard to keep the energy of the room at a constant high. The 80s theme itself is well executed and credit must be given to the effort of creating alter egos for all members of the audience. The inclusion of a range of memorable tunes and certainly brought back a flood of good memories for the guests, even if these weren’t always accompanied by the ability to recall the lyrics. The show itself is very long, well over two hours, and the three course meal (cleverly named after various individuals from the 1980s) is average at best. Writer, director, producer and actor Simon Robinson may have bitten off more than he expected with this effort. However, because of his committed cast The Time Machine does provide an entertaining night – just don’t expect it to be brilliant theatre.